Michelle was inspired by Olympic champion Anna Meares. She chose an asymmetric design with a combination of plant materials featuring red for strength and pink for femininity together with gold embellishments and wrap to represent a gold medal for an Australian champion. 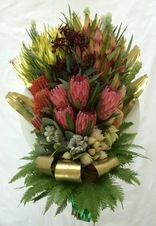 Here the inspiration was blending the strength and national colours of Australia and Brazil. Ashleigh interpreted the theme with plant materials of green and gold and a balance of Australian wildflowers and orchids from the tropics. Touches of gold are repeated through the colour of the banksia colour and Vanda orchids. Her beautifully constructed sheaf is easy to hold. She used environmentally friendly products in the wrap and jute to finish her sheaf in an effort to highlight sustainability. Christina was inspired by the courage and strength of Australia’s Paralympians. 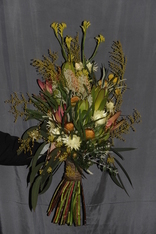 She used a combination of green and gold tones in the foliage and flowers (including helichrysum, grevillea and dryandra) to represent the colours of Australia in a symmetric design. The binding compliments her design. Lynette was inspired by the Olympic creed - strength, heart, fire, passion, focus, discipline, stamina, tradition, change and hope. 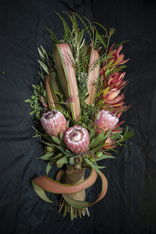 Featuring flax curls, proteas and leucodendron, this sheaf was created to form a dynamic selection of materials. This design with brilliant colour, form and movement truly interprets ‘Samba’! Jenny was inspired by the Brazilian traditional dancers and her embellishments of feathers and ribbons truly celebrate the carnival atmosphere in Rio. 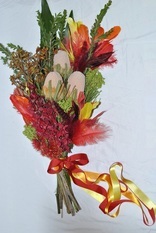 The sheaf is well constructed and features Australian banksias and vibrant red orchids to accentuate the richness of the workpiece, and the culture found in Rio de Janeiro.